Overview: Cricket Communications was a subsidiary of former regional operator Leap Wireless. Cricket operated its own network in 35 metropolitan areas including Chicago, San Diego, Seattle, Philadelphia, Washington DC and Baltimore. In areas where Cricket didn't have its own network it operatesd an MVNO reselling Sprint services. Leap and Cricket were acquired by AT&T Wireless in March of 2014. On May 18, 2014, AT&T combined its AIO Wireless prepaid brand with the assets it acquired from Leap to launch Cricket Wireless as a less expensive alternative to GoPhone. Cricket began shutting down the CDMA network Mar 15, 2015. The shut down was completed by mid-September, 2015. Technology: Cricket uses the 1700 Mhz AWS and 1900 Mhz PCS bands for CDMA voice and 1xRTT (2.5G), EVDO (3G) and LTE (4G) data. This profile covers Cricket's legacy CDMA based service which has been shut down. 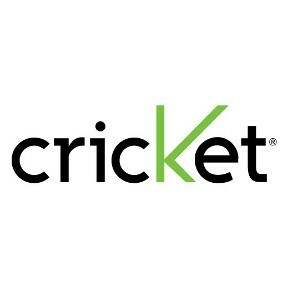 For information about Cricket's current GSM service on the AT&T network, see Prepaid Operator Profile: Cricket (GSM). Plans: Cricket currently offers only monthly CDMA plans. Plan pricing and features in markets where Cricket operates its own network are different than in markets where Cricket operates as a Sprint MVNO. 3 Includes unlimited song downloads, ringtones and ringback tones. Muve Music capable phone required. 6 Includes unlimited song downloads, ringtones and ringback tones. Muve Music capable phone required. International Rates: Cricket offers a $10/month Unlimited International Long Distance plan add-on for plans priced at $35/month or more that lets you make international calls to over 100 countries (check if a number is covered) using direct dialing. Even without a plan Cricket's international rates are fairly low (Canada .10; Mexico (landline) .10; China .10; UK (landline) .10; Philippines (landline) .20. In order to make pay per use international calls or use pay per use international messaging you need to add money to your Cricket Flex Bucket at a Cricket store or by calling *729 form nyour Cricket phone or 1-800-Cricket from another phone. Unused Flex Bucket funds expire after one year. Devices: Cricket offers a large selection of feature phones and Android devices, the full iPhone line and a lone BlackBerry. There is a limited Bring Your Own Device (BYOD) option for CDMA phones from other operators that's available from some Cricket dealers for a fee. Data doesn't always work on BYOD phones. Online using a debit or credit card or checking account. Auto-pay using a debit or credit card or checking account. Setup auto-pay here. Using the MyAccount app on the phone. Sending a text message to “*PAY” with the last 4 digits of a previously used credit card, debit card or bank account. Example: *PAY 2468. Mailing a check to Cricket Communications, PO Box 660747, Dallas, TX 75266-0747 (allow 10 days for delivery and processing and write your Cricket account number on the check). Account Management: You can check your rate plan, payment amount, expiration date and flex bucket balance and make payments and plan changes using the My Account section of the Cricket web site or the My Account app on the phone or by calling *611 from your wireless phone, or 1-800-CRICKET (1-800-274-2538) from any phone. Online call records are not available. Call Forwarding, Call Waiting and 3-Way Calling (Available on most plans, call forwarding is not available on MVNO (PayGo) plans). To forward all calls to another number: Press *72 followed by the number you want calls forwarded to (*72-123-456-7890), press Send and wait for a confirmation tone or message. To cancel call forwarding: Press *720 SEND and wait for a confirmation tone or message. To forward unanswered calls only (conditional call forwarding): Press *74 followed by the number you want calls forwarded to (*74-123-456-7890), press Send and wait for a confirmation tone or message. To cancel conditional call forwarding: Press *740 SEND and wait for a confirmation tone or message. Call waiting: Call waiting lets you place one call on hold while you take another call. When you are on a call and have another incoming call, you will hear a short tone. You'll have approximately 30 seconds to answer before the second caller is forwarded to voicemail. 3-Way Calling: Lets you create a conference call between yourself and two other people. *PAY - with the last 4 digits of a previously used credit card, debit card or bank account. Example: *PAY 2468. Cricket Pros: inexpensive unlimited plans, strong retail presence in native coverage areas, some BYOD, 24/7 telephone support. Call waiting, call forwarding and 3-way calling supported. Text (and extra-cost voice) roaming available almost everywhere that has CDMA mobile service. Cricket Cons: Data and no extra charge voice coverage is somewhat limited (similar to Boost and Virgin Mobile). BYOD is limited. Extra charges for some payment methods. No online call records. iPhone is not for sale in my area. How do you find out what 60 Cricket markets sell iPhone without entering dozens of zip codes? No wonder they have only sold half of their commitment to Apple ($100M short). Can anyone explain to me what is the advantage of using Cricket's $35 monthly over Air Voice's $30 plan?? I am in San Diego and travel extensively to L.A. from what Cricket's rep told me I have to use at least 60% of my minutes in San Diego, or they will disconnect me, a restriction that Air Voice doesn't have. Aio will soon be Cricket. The New - Cricket Wireless is Born. The Old Cricket (March 17,1999 through May 17,2014) for a run of 15 Years and 2 Months!!! The migration proces s from Cricket Legacy to the New Cricket has been absolute hell! I had Cricket Legacy for almost 2 years and never had an issue. I even moved from Ft Collins, CO to East TX and still had no issues. I hope the only reason I've had such ttrouble is because the New Cricket Customer Service Reps are new trainees who aren't used to the company and aren't used to customer service. Honestly, each time I've had a problem with the migration process, it has only been resolved after contacting a CSR with Cricket Legacy. AT&T needs to train these guys better. And I hope they work out these hiccoughs before they lose all their previous customers. Seems like an update is required for this Cricket article - it's not CDMA any longer being fully owned by AT&T. Please read the 4th and 6th paragraphs.